Every Thanksgiving, volunteers from a group of churches in Moore County come together to prepare Thanksgiving meals for kids and their families who receive weekend meals through the BackPack Pals Program at our Sandhills Branch. As we approach the holiday, we wanted to share with you how they help to restore health, hope, and dignity to some of the families we serve. The stranger told the volunteer that yes, actually, she did know someone. She knew a family with young kids that lived close by who wouldn’t have a special meal that day. The volunteers packed up their car and drove five miles down the road, following the directions she had given. The volunteers approached the front door and rang the bell. A mother answered. They explained to her that they were volunteers with a local church, that they had prepared Thanksgiving meals for folks in the community, and that they were here to drop off plates for her and her whole family. The mother stood at the door, shocked and unsure of what to say next. She thanked the volunteers and told her kids the good news. Excitement suddenly filled the house. The kids ran around, thrilled that they would now be able to enjoy a Thanksgiving meal, just like all of their friends at school. The volunteers brought in the plates of all of the Thanksgiving favorites: green beans, yams, rolls, stuffing, gravy, dessert, and of course, turkey. They also gave the family a bag of groceries and a couple of extra Thanksgiving plates to help sustain them for the following days. For this family, this blessing wasn’t just about receiving a warm meal. 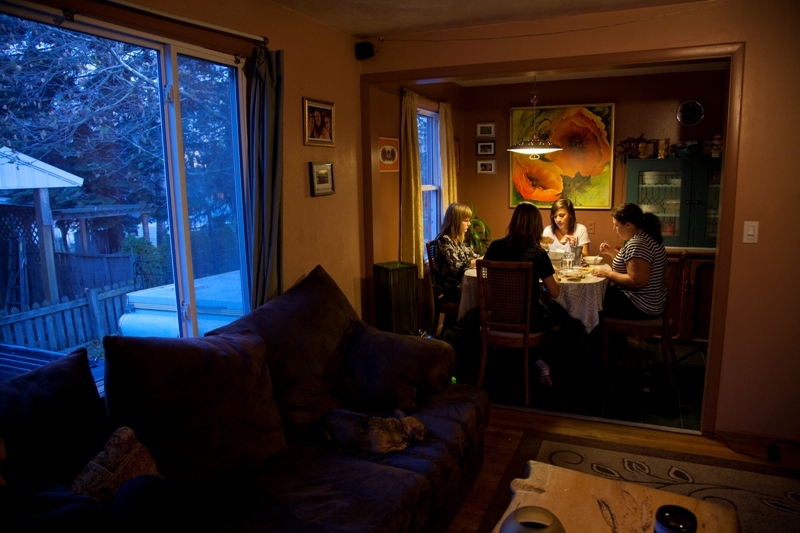 Strangers had come to their home and brought them a Thanksgiving meal, lifting their spirits and bringing a sense of normality and fortune to their dinner table. For the volunteers, it was a big moment, too. The experience of serving Thanksgiving meals to families in need is touching and rewarding to be sure. But to be able to show up at a family’s home, out of the blue, and provide several days worth of hearty meals to a mother and her children… That was something to be thankful for indeed. Every Thanksgiving, these volunteers and many more from a group of churches in Moore County come together to prepare Thanksgiving meals for kids and their families who receive weekend meals through the BackPack Pals Program at our Sandhills Branch. These families are identified by teachers in the schools to be food insecure, often unsure of where they will find their next meal and likely without special meals during holidays. The volunteers also prepare extra meals for anyone else in the community who may be in need of a hot meal on the day. Now in its fourth year, this operation runs smoothly and continues to expand. Over 100 volunteers work together to collect food and funds year round for these meals. On the Wednesday before Thanksgiving, volunteers smoke the turkeys in big cookers and let them cool overnight. On Thanksgiving morning, they all gather at Fairview Baptist Church while a dozen volunteers bustle swiftly around the kitchen, whipping up the side dishes. The rest move quickly through a large assembly line, arranging all of the hot food onto large, individual plates. Last year they provided 580 meals. This year they expect to serve 900 plates of hot holiday meals to local families. And it’s only up from here—they hope to grow the effort large enough that they can give Thanksgiving meals to every BackPack family in Moore County. It’s an incredible service to the community and we know these Thanksgiving meals make the holiday special for our neighbors in need. And yet, at the same time, they also make it just like everyone else’s. For so many families these prepared meals are an opportunity to take part in the tradition that we all enjoy with our families around the dinner table this time of year. It’s a shared experience that every kid, grandparent, and family deserves to have, that replenishes our spirit, and for which we all give thanks. These churches like many of our partner agencies work hard to provide holiday meals to food insecure families. We thank them for their service and wish everyone a pleasant Thanksgiving shared with friends and family. If you’d like to help make a difference this holiday season, give to our Holiday Meals Drive to help ensure our partner agencies have stocked shelves and warm meals for local families.